Are you looking for a machines that combines power, agility, and precision? The 4-5 tonne B-9 offers it all. Discover all its features! This new line of 9-series electric forklifts trucks. This newly designed 4 wheel counterbalance truck provides improved ergonomics and unmatched performance. This forklift has it all... smooth running, operator comfort, dual AC drive system, low energy consumption, anti roll back, exceptional ramp start capabilities, gradeability and a lot more. Advanced Safety includes optimised lift cylinder arrangement ensuring wider visibility, panoramic mirrors, strong overhead guard exceeding ISO and ANSI regulations, low entrance height, Led safety lamps and rear reflectors, fork safety features, OPSS and many other safety options are available. Extended maintenance intervals, enclosed drive and pump motors and brushless AC motors improve efficiency and lower maintenance costs. The ideal arrangement of components ensure easy access & convenience for maintenance. 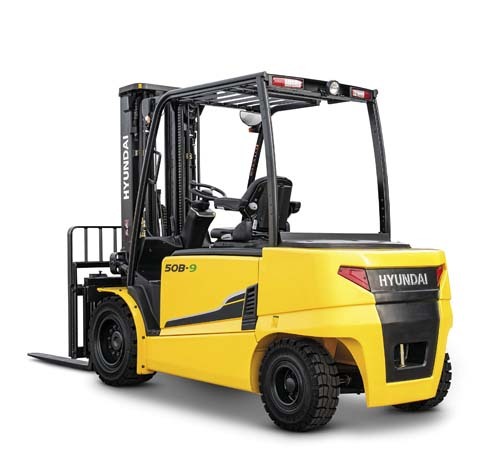 A viable option to replace your diesel forklift today.